You are here: Home / amish / Snap It to Win It Contest! We all have that moment when we realize our lives are too stressful, too busy, too filled, and instead of feeling content with ourselves, our relationships, our lives, we end up disappointed, overwhelmed, and burnt out. Sometimes even the simplest reminder—whether it’s a photograph or a page of encouragement from a book—can help us de-stress and re-prioritize our lives. My new book, The One Year® Book of Amish Peace, taps into the wisdom of the Amish in order to help us draw closer to God and hear his voice—encouraging believers to carve out more time in each day to listen to God and experience his presence. These daily devotions are a way to help us re-prioritize our lives and focus on what really matters. In celebration of the book release, I have a challenge for you: to look at your daily lives and find peace, joy, and inspiration in them. When you find something that inspires you in your life, take a picture of it. Upload it to your computer. Make it fancy and beautiful. 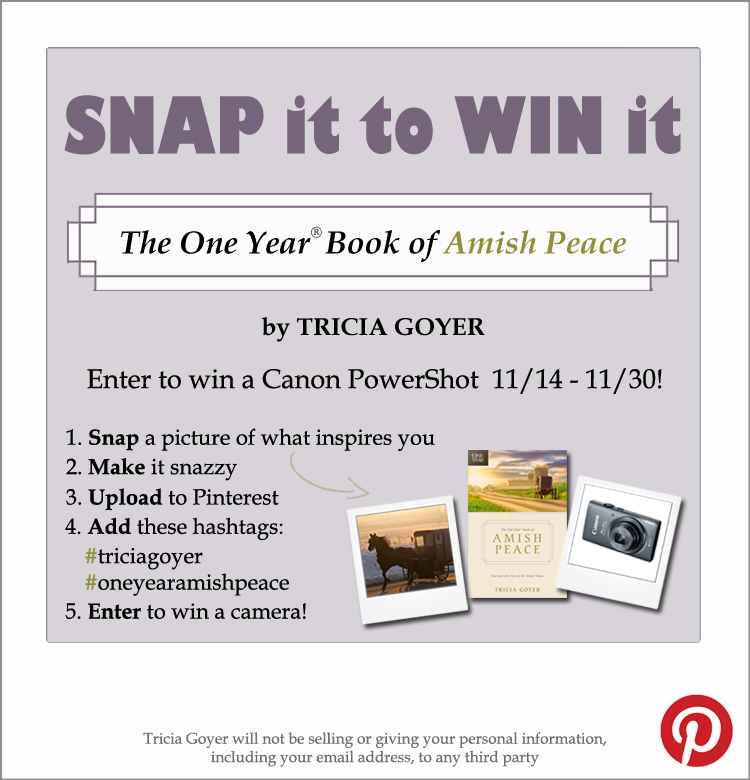 Then upload it to Pinterest with the hashtag #OneYearAmishPeace and #TriciaGoyer. The contest will run from 11/14 to 11/30, and on 12/2, I’ll announce the winner (chosen at random) on my blog.The winner will receive this cool camera so you can continue to find inspiration in your life and photograph it as a reminder that peace is achievable. You can pin one photo per day to be entered into the contest. What do you think? Can you take some time this Thanksgiving season to be thankful and to find peace with the simplest things in life? I can’t wait to see your photos! Want to help me spread the word? Add this button to your blog! Pin to Win Today – 11/14 – 11/30! Looking for a Christmas present to give to a reader this holiday season? Why not give a copy of The One Year® Book of Amish Peace? can you imagine, I ordered your latest book Amish Peace, received it a couple of weeks ago, and didn’t even know that it was only released this past October. I haven’t started reading the devotionals, but will get to it in January. I am reading a Christmas book written by a fellow writer namely Suzanne Woods Fisher: “A Lancaster County Christmas”. I wanted to order “The women of Christmas” but it normally takes about 3 months before I get the books. So, Christmas will be long over …. Maybe next year. Christmas is my favorite Holiday, especially since I am came to Christ. And now it has a new meaning: the Birth Of Jesus. I love to read Christmas books, as well as Amish fiction or non-fiction books. So yours is on my list as well. Perhaps I might even find it in Dutch (as I am a Belgian christian mom). So from my home to yours: Happy Thanksgiving! Abby, it’s so wonderful to connect with you! I’ve only been through Belgium once, and I’d love to go back. I feel as if I’ve been there more often because I’ve written about Belgium in a number of my books. THANK YOU for being such a faithful reader!! I know many of my novels are in Dutch. It’s such a blessing to me that publishers choose to translate them. God is good!